Update: Based on the wording of the Automotive News story, this post originally reported that the Hellcat would get all-wheel drive. Its writer now says that, unfortunately, is not the case. That story, as well as our post and headline, have been updated to reflect this clarification. This, apparently, from a lede-burying story by Automotive News yesterday about the future of the Dodge lineup. There’s some stuff we knew in there, like the eventual demise of the Dart and Viper (RIP), and that the Charger sedan will eventually move to a less beefy Alfa Romeo-derived platform in 2018. Dodge will introduce its first V-6 all-wheel-drive Challenger, called the GT AWD, this fall. A wide-body, rear-wheel-drive Hellcat-powered version in 2017 called the Challenger ADR will follow. The Challenger will be redesigned onto the Giorgio platform in 2018, when it will lose an expected 500 pounds from the current model. 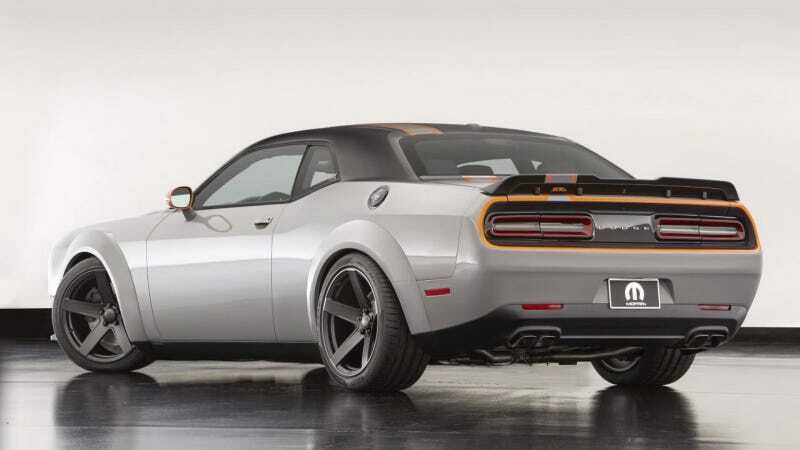 Last year Dodge unveiled the seemingly production-ready and creatively named Dodge Challenger GT AWD Concept at SEMA and that led more than a few folks to speculate that one would be built eventually. Sadly, it’s only getting the Pentastar V6 and not the mighty Hellcat engine. The Challenger ADR, is an even more interesting animal. Chrysler fansite Allpar and others have reported on rumors around this car, short for American Drag Racer, for some time now. It’s supposedly a track-centric Hellcat designed with a focus on traction. Like the Mustang and Camaro, Challenger sales are down slightly, but the platform is a proven and paid-for deal that makes money for Fiat Chrysler and has a ton of buyer loyalty. There’s plenty of room for more special editions, especially all-weather and drag racing ones.